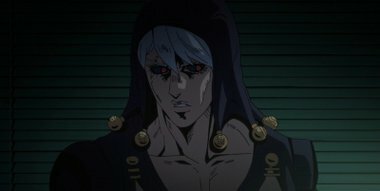 Using Baby Face's Stand's ability to turn human parts into other things, Giorno uses his Golden Wind to make parts for the human body. He rebuilds his own body and fights back. Meanwhile, another member of the Hitman Team who's also after Trish, Ghiaccio, was trying to regroup with Melone and was driving to Giorno's location.